In this article, see out the cool 50 best free android apps for your all needs. As you know that , there are thousands of apps are available on Google Play Store. Especially in the recent years, dozens of new apps are added to play store. – What is the best and cool Android apps ever? 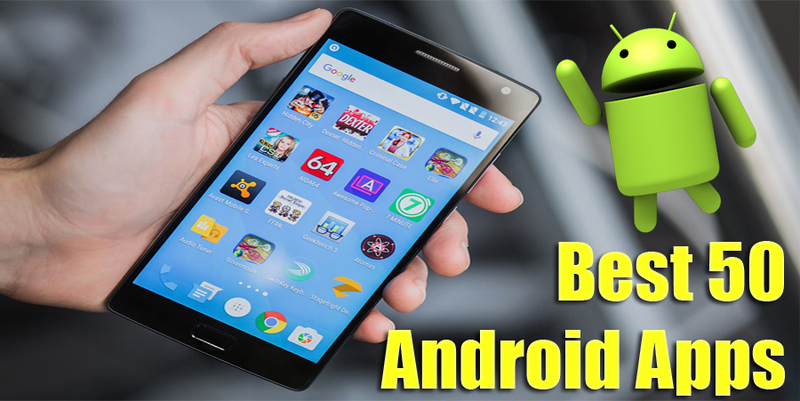 That’s why here is the top 50 best android apps that fulfill your all smartphone needs. I’m searching a lot and then collect this list for my loyal readership. Hope you like this and if you love this post, then share it with your friends . These apps are fully updated and mixture of some free and paid ones too. All apps are chosen by android and smartphone experts. Google Drive is a fully approved, safe and free of cost app for all types of devices like smartphone, tablet, or even computer. You can add your videos, files, documents, photos etc and make a back up to save your confidential data easily. You can also doing some other tasks like invite your friends to see your files and edit them and also leave their reviews about it. VLC Media Player is a very powerful multimedia video player for playing your favorite music and videos especially in your desktop computers. In android, VLC app is also available which is top and rated and many android lovers use this app for playing their musics to their android devices. Android app for protect your information from different phishing, hacking and others. It is the best android app. It also protect your android device from all kind of viruses, malware and spyware. It is very easy to use and suitable for all devices.It contains ultra fast and powerful scanning technology with minimum system resource. The most powerful weather and radar for android wear. Fully interacting with the watch wear faces and also fit integration with Google. It is very necessary app for those who wants to know about the updated report about weather. Without any doubt you’ve seen dozens of free and paid apps for image or photo editing, but the Photo Editor for Android is a very simple , responsive, amazing themes, and free editor for editing your photos. Using this android application, you can easily convert your mobile device into a full fledged small studio for photo editing. Secret AppLock is a best android app locker . It is very powerful app to protect your data, privacy and keep you remain safe like as a guard. When you installed any new application using password, pin lock or any others. You can use pass code security function to secure your apps. It is a app protector which secure your phone, gallery, contact list, emails, text messages, videos and photos etc. If your smartphone, android phone, tablet working in slow ? then don’t worry here is the solution, “Devices Speed Up For Android”. Using this app, pushing the button and get free cache memory, which will make your device much faster than previously one and working well in better way. This app speed up your mobile devices up to 60%. You can easily use this app .All installed applications are also working fast and better. The amazing and awesome android app called “Flashlight On Clap” which is available free of cost on Google Play Store. Whenever you seen the dark at night or at home, and torch light are not available, simply clapping one time and your android app will be turn on automatically. Yes ! it is possible , use this app and enjoy this feature. Caller Name Announcer the amazing app which announces your callers name whenever they call you. When any person calling your number, caller name announcer speaks every thing , it’s name and if any one send you a text messages, it will also reading all the contents of the SMS. It is the amazing and cool android app. It uses are built-in Android text-to-speech technology which identify and speaks the incoming caller name and also text messages sender name and it’s contents. Ancleaner the latest version is Ancleaner 3.0 which is known as the best android app. Ancleaner clean your android smartphone and reorganizes your contents. You easily delete everything which you want to even stop any process. It is very simple and safe cleaner. It’s also improved your graphic design and also your android device working with better performance . When you surfing online, there are many things which you want to download via your smartphone like Android mobile. There are many other options are apps are available for downloading such files from the internet. But the “Download Manager for Android” app is specially designed for downloading files, songs, videos, images from the internet via Android Smartphone . It download 3x times faster than any other app. It supports all types of files like, APK, RAR, ZIP, MP3, DOC, XLS etc.Also download images, videos from the Facebook. If you want to shopping online or any eCommerce then Groupon app is best for you. Groupon delivers up to deals with 70% off on the your best choice stuffs. You can buy more than 500 cities from all around the world. When you purchase anything online via this app, you’ll get 70% off on all products. LastPass is a security app for all devices specially for android devices. LastPass becomes the most popular and cool android app for android phone users and it becomes the editor choice. LastPass is a password manager and password generator that will be used for locks your personal and confidential information. LastPass automatically saved your web browser and logins app and also generates new passwords with full security. You can use this app on smartphones, tablets, and personal computers too. Pocket is a very amazing and popular social bookmarking site which quickly save and discover and recommend your best and most famous interesting stories from the internet. Also get the awesome reading experience with fully user friendly. You can also customize it with your needs. Also discover new stories all around the world from the web. Zedge becomes the most popular and best Google Play app in 2015 which offers thousands of free wallpapers, ringtones, icons, notifications sounds which makes your device more amazing.All wallpapers are perfectly match with your user interest. It contains very powerful search technology with suggestions. Greenify is the best android app especially at Android Authority Top 3 Best Root Apps. When your smartphone, tablet become slower and battery comes down when you installed dozens of apps into your device. With using Greenify, your android phone running more faster and more smoothly. Clean Master is the most famous , most trusted android optimizer, speed booster and also work as battery saver. It is a free anti-virus app for scanning and securing your mobile phone from viruses, malware etc. It can lock your installed apps and battery saver. It cleans your junk files and also boost your memory space. Clean Master is the best antivirus in the market which is also used as app manager, game booster , and auto-start manager etc. WiFi Mapper is a free global WiFi database which contains more than 3+ Millions hotspots. It show you the map of the nearby free WiFi hotspots. You can login with your Gmail or Google+ account for commenting and classify hotspots. Also filtered your WiFi or place types. Tengi is a social instant messaging app which pays you back from a competition. You can use this app with amazing features and some twist .When you chats with your friends you will get a tickets for a weekly free prize draw where you won amazing prizes from up to 10 Lakhs in cash and also thousands of other small apps and gifts prizes. The more friends you’ve on Tengi, the tickets you won, and the more revenue you generates. Timehop is just like a time machine app which show you the memories on the same day up to three years back. It helps you to celebrate the bet moments of your past. When you share something on Facebook , Twitter, Instagram etc just after the three years you can also see these memories using Timehop. It is best android app which downloaded many times and getting 4.2 reviews ratings out of 5. Hope you can fall in love with this app. Whatsapp is the most popular and more downloaded app on the Google Play Store which is downloaded up to 3,95,00,000 + and every day numbers increase. Without any doubt, Whatsapp becomes the best android app. Whatsapp messenger is a free messenger app which you can use for sending text messages and pictures and even videos for android to all other smartphone devices. You must have a internet connections if you want to use this app. OverDrive is work as a your online digital library for borrowing ebooks, audiobooks, and video streaming clips using OverDrive from your android device. It contains more than 30,000+ libraries worldwide that offers you. OverDrive available 24/7 , so anytime you can use this app . So simply download it and install into your android phone. Feedly is a free RSS News Readers which use for easily read all your latest news around the world. You can easily organize your lists, your news feeds, podcasts, YouTube videos and getting fully updates when any new update comes from any where from the WEB. Feedly is the very amazing app and almost every use it and call it the best android app. There are millions of people use Feedly app on android, iPhone and all other smartphone devices. If you use Reddit network and want to get all the latest feeds directly into your pocket then “Sync for Reddit” app is designed only for you. There are many other Reddit apps are available in the market but no one official launched. Sync for Reddit is a very small in size, fast and user friendly app with amazing performance. Synchronized your all latest updated posts .Over 5,00,000+ subreddits are also subscribe on Reddit and increases day by day. Imgur is a free image photo album for your pocket. Imgur becomes the most popular photography best android app. It is the more downloaded app and the biggest photo sharing website on the internet. Imgur is very easy to discover and enjoy the most awesome and amazing beautiful images and photos on the WEB. Install this app into your android phone and use this site to your smartphone. Periscope is the cool android app used by thousands of android users. As you know that the future world is the video sharing world where every thing described in video format. Periscope help you to live streaming online via smartphones with the world. As much you’ve followers can join you, as much views you get on Periscope while you online live streaming. People can comment and send you messages in real time. It is very popular android app which is downloaded more than 2,50,000+ times from Google Play. This is a paid app, but you can use it’s free version too. It is free running and fitness app. It is used as your fitness tracker who manage your distance, time, speed, elevation, calories burned and more . It is the best running apps. It is fully optimized for Android devices. You can use it for your personal fitness tracker. Go Speed is the No.1 applock and cleaning app in the world for optimizing your device speed. It clean your all junk files with full security and makes your device faster up to 60%. It contains black hole speed booster with app-lock, junk files cleaner, app manager etc. It has much downloaded and very good reviews by it’s users. Skype is the internet messaging and video calling app which is very popular. But after the invention of Whatsapp it gets down. But it is used mostly all around the world, using video calling, instant messaging, all are free of cost. You can create new groups to add your friends and family members. Anyone can call you and you can too. Share photos, videos, clips , text messages, etc. iMO is a very popular video calling and instant messaging app which is gets more popular all around the world in a very short time. Using this app, you can video chat with your friends, and family free of cost simply by connecting to the internet. Send unlimited messages and voice calls, and video calls easily using 2G, 3G, 4G, WiFi internet connections etc. Snapchat becomes popular in the category of photo sharing sites and apps. More than 70,00,000+ users already installed this app and use it. When you live , makes your life more funny simply by using Snapchat app. You can simply snap your pic / image and share with your friends directly using Snapchat app. The Google Officially launched this app in May 2016 .It is the fastest, and easiest way to explore the new ways of surfing. By using Google App, explore movies, musics, photos and all other types of contents for your Android TV, when you want. You can also use your voice for searching and exploring the WEB. When your android phone lost or anyone getting your phone from you then don’t worry you can track your phone simply by using “Lost Android” app. You can easily wipe your phone, lock your phone, erase your SD card easily, send free SMS from WEB, remote SMS wipe phone, remotely manage your phone , start and stop GPS, start and stop WiFi options and much more. Chess is a very powerful and amazing game app which you can play on your android phone by using Chess for Android app. It will consist of the chess engine and GUI ( Graphical User Interface). You can play this game by keypad or by touch screen. Millions of people already use this app using their smartphones. Weather and clock widget for Android devices, provides you the full report about the weather of every single day. It is the best app in the category of Best Android App for Weather. You can see the reports about all around the world, it will searches the addresses automatically, and tell you about the current temperature in Celsius and Fahrenheit scale too. It also provides you the atmosperic pressure, distance visibility, humidity etc. It almost support all smartphone devices. It the best video converter for android devices. Video Converter Android is a very simple , but powerful app for android lovers. It will scan first and then convert your files into other formats. You can also extract the MP3 music from your video files and MP4 to any other formats. As if you always connected to the internet and facing many different types of advertisements online, then use this app which is most popular for desktop users, now available for Android users too. It is the most popular ad-blocker in the world. It blocks all ads. Popularity of this app will be estimated through its download numbers which is up to thousands of times. There are dozens of browsers are available for online surfing for your smartphone devices, like Opera, Chrome, Safari, Firefox etc. But the most amazing, powerful, fast, and simple browser for android users is the “UC Browser” which has very fast downloading speed. Watch videos without any waiting, fast and stable, also use adblock for blocks all online ads. Download anything from the internet with high speed. There are 99,00,000+ users download this app from the Google Play Store. Now get the free and fully approved 100% unlimited version of the Hotspot Shield VPN Proxy app with all basic features and options . You can easily unblock and accesses all the websites on the internet which are blocked.Stay private and anonymously search online. Get protected from the hackers and snoopers. It is a free, unlimited and simple security app for android users. Angry Birds which destroy the greedy pig’s defenses with using the unique powers. It is the best app for playing children as well as all ones. In this game, the survival is at the stake position. Angry Birds is the best app in the category of Android Games app and downloaded more than 48,00,000+ times from the Play Store. Just like Angry Birds , the Subway Surfers also a very popular game app for android devices. It is a fast and user friendly GUI . Dodge the incoming trains and ups and down using keys or touch screen. Colorful and HD graphics interfaces. It is the most popular app in the App Store which is downloaded more than 1,95,00,000+ times.It is compatible for all devices. Voice Translator can translate up to 50+ languages of what you say .You can speak and this app will translate your voice into any language (50 Language Supported). You simply speak via microphone and app will convert your voice into other language . Voice Translator supported languages are English, Arabic Albanian, Malay, Spanish, Persian, Indonesian, Hungarian,Swedish, Korean, Japanese, Russian etc. Sweet Selfie basically designed for Selfies lovers. Simply capture your photos and edit your images using Sweet Selfie. Every time you’ll take a best and awesome selfie. It contains many filters for keep your selfie more beautiful and awesome. It is very stylish and fashion-halo filter effects. Emoji and tag stickers also available with many new features for making your pictures more beautiful. This app is specially designed for business purposes. It is the latest office suite which is more faster than any other office editors app. It is the Google Play Editor choice app which is most downloadable app from the Play Store. You are able to create, edit and view all office documents with full compatibility with MS Office formats like DOC, DOCX, XLS, PPT etc. Quran is the last Holy Book of Allah for Muslims. Muslims recites Holy Quran daily , so this app also designed for Muslim Community. It is a free Quran application for android users. It contains many features. Quran for Android contains crystal clear Madani compliant images and gapless audio playback. You can also bookmark, tagging and sharing facility use. MX Player is the best multimedia app for smartphone android devices for playing your favorite musics and videos in HD quality with full controlling features. It has many features like hardware acceleration, multi-core decoding, pinch to zoom feature, kids lock and many others. MX Player is the top developer choice which is downloaded more than 35,00,000+ times from the Google Play Store. YouTube without any doubt the best app in the world which you can use for watch your favorite videos without any hesitation . Without buffering this app will be fast loading feature which you can use to watch your videos with fast loading speed. It is a Google product and best developer choice which is used by almost everyone who’ve a smartphone. It is the trusted and best android app which is Officially Launched by YouTube Inc.
Face Swap is a very funny but best app for android users. Simply upload any two photos and swap their faces using this app. It will be automatically face detection technology use. Adjust your face and swap faces . You can also save you photos into your SD Card and also share on Twitter, Facebook, Google+ , Instagram etc. CCleaner is the best cleaner which is used by every Desktop users on their PC. It is officially launched their app for android smartphone devices to use this into your phone. By using this app, clean your phone and safe from different viruses and malware. CCleaner also makes your smartphone speed more faster .Piriform make this app which is a official owner of CCleaner. Maps is the Google product which is the best developer choice . It is most popular smartphone app on the Play Store which is downloaded more than 60,00,000+ times.You can navigate the whole world faster and easier using Google Maps. It provide you accurate map up to 220+ countries from all around the world. So this is the list of 50 cool android apps for android phone users. You can download these app into your smartphone and install them. These application helps you and fulfill all you needs. All these are the best application for android phones. Hope you like this list, and if you like this article, then share with your friends like on Facebook, Twitter, Google+ etc. If you’ve any other suggested android application, then share us in the comment box below. Thanks ! ! !